GIS Analysts are usually in the back room performing support rolls with most law enforcement operations, but recently a GIS Analyst was part of a marijuana eradication raid in California. A GIS specialist went in with the raid teams for the first time in NPS history to perform an immediate on the ground evaluation of the impacts to the natural resource during the raid. 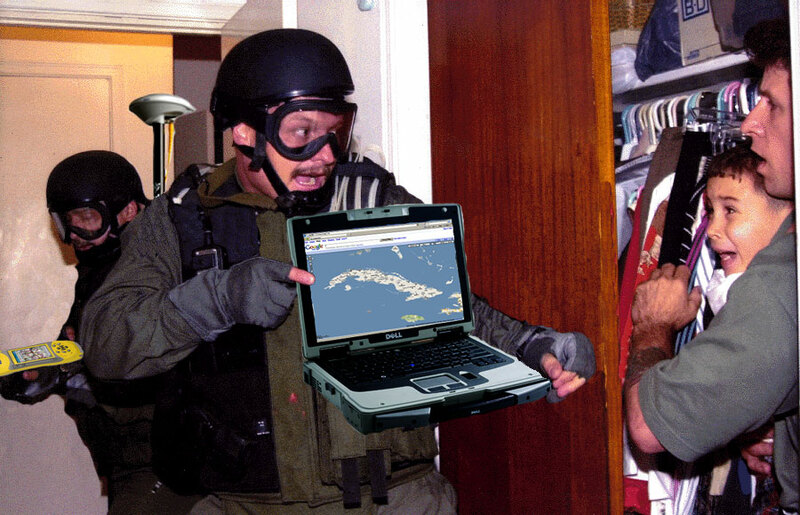 Just think how much better some law enforcement situations might have gone if GIS had been part of the raid. On September 10th, Redwood National and State Parks conducted a marijuana eradication raid, utilizing an interagency anti-drug task force. The focus of the effort was a marijuana plantation in Redwood Creek that contained 9,564 plants and covered approximately five acres on steep terrain. This marijuana site is within six miles of the world’s tallest tree in a park that is also a World Heritage Site and International Biosphere Reserve. Rangers detained five Mexican nationals for questioning about a mile from the marijuana growing operation. Three of them had prior deportations and were transferred to United States Immigration and Customs Enforcement (ICE). One who is on felony probation for marijuana was held on that violation and will be deported later. The fifth was charged with providing false information to an officer. A GIS specialist went in with the raid teams for the first time in NPS history to perform an immediate on the ground evaluation of the impacts to the natural resource during the raid. This documentation will be very beneficial for the restoration process. Significant resource damage has resulted from this illegal activity and an initial cleanup operation using California National Guard soldiers and helicopter is planned for October. This raid included almost 60 law enforcement and support staff. The National Park Service wishes to acknowledge and thank the support provided by Humboldt County Sheriff Office, Campaign Against Marijuana Planting (CAMP), North State Marijuana Investigation Team, California Department of Justice, California Fish and Game, California Bureau of Narcotics Enforcement, Green Diamond Resources Company, United States Coast Guard, Drug Enforcement Agency (DEA), Federal Bureau of Investigation (FBI), United States Marshall Service, California State Park Rangers, National Park Service SETT II team and ISB Pacific West special agents.